We now have names to go with the characters revealed in The Force Awakens’ teaser trailer! Entertainment Weekly has received official retro cards made from the trailer and they give the names of the characters we see. John Boyega’s Stormtrooper is named “Finn”. 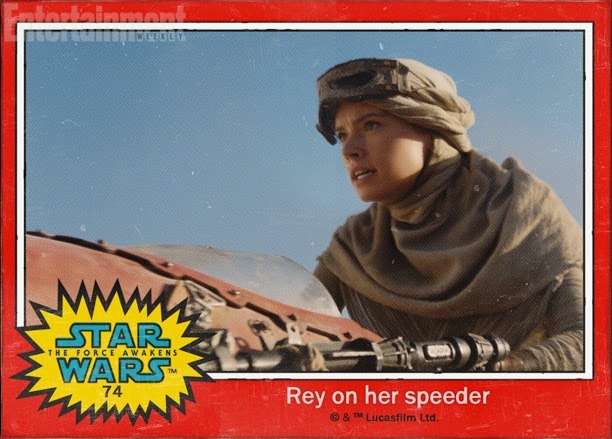 Daisy Ridley’s desert dwelling character is named “Rey”. The new droid is “BB-8″. Oscar Isaac’s X-Wing pilot is “Poe Dameron”. Adam Driver’s Sith Fanboy with the controversial ancient saber is “Kylo Ren”. There are still a lot of characters we don’t yet have official names for, but this is a pretty awesome way for them to reveal the names of the characters from the teaser!